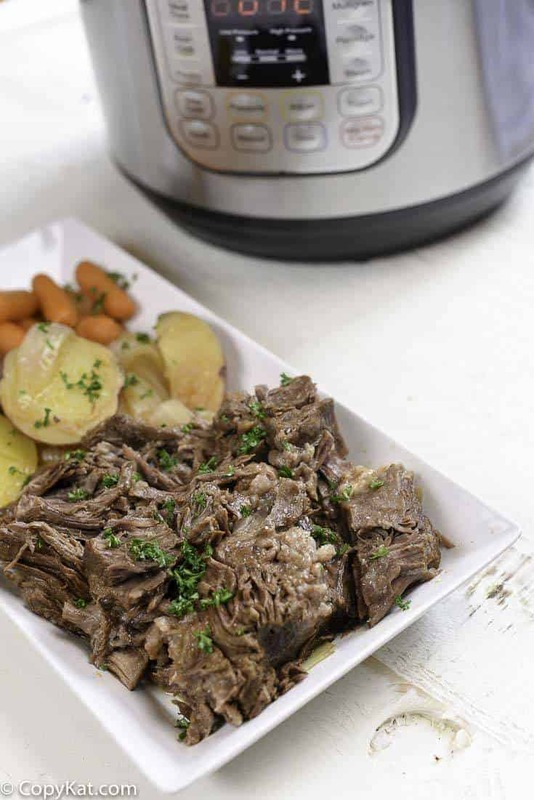 If you have an Instant Pot, one of the must-try recipes you should prepare is a pot roast. You can see how easy it is to prepare a perfectly cooked pot roast with this simple recipe. If you have an Instant Pot, I can imagine you want to use it and see if it is really worth all of the hype. You really can make a variety of dishes in your Instant Pot, and you can do so easily. I have made dishes like Thai Chicken Curry, Macaroni and Cheese, and Beef stew and a variety of other great recipes. Making a pot roast in your Instant Pot is fairly easy to do to. Instead of braising it in the oven you can pressure cook one in about half of the total time. I do something a little different than other recipes you may see online. I like to cook my vegetables after the meat is cooked. I have found that if I cook my vegetables for the same amount of the time I cook the meat for, the vegetables become soft. I like the vegetables to be tender, so I cook a pot roast in two stages. One long cooking cycle for the meat, followed by a very short cycle for the vegetables. My recipe is written for a 6-quart Instant Pot. If you have a larger Instant Pot you will need to increase all of your ingredients. For example, I would use a 4 to 5-pound roast, and then I would increase everything by one-third, but I would leave the time the same. Most people do purchase the 6 quart version of the Instant Pot. This pot roast recipe is very simple. You will want a package of dry onion soup mix, tomato paste, and beef broth or stock. You may also want to add vegetables to this, I used onion, potatoes, and carrots. If you wanted to change this you may want to add a few bay leaves, or perhaps a clove or two of garlic. To make a change in the recipe, add the spices to the initial cooking if you want a more pronounced flavor, and if you want a more delicate flavor you can add the herbs when you cook the vegetables. 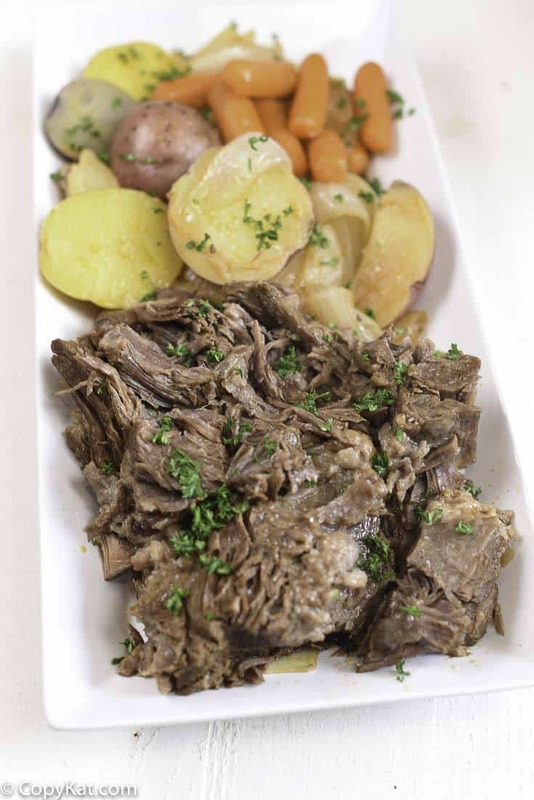 I hope you give this recipe a try soon, I think you are going to be surprised at how easy it is to prepare a flavorful pot roast. You can make a tender an juicy pot roast in your Instant Pot. Set your Instant Pot to saute. Heat two tablespoons vegetable oil, and then lightly salt both sides of the roast. Brown both sides of the roast, it should take about 6 to 7 minutes per side to brown the roast. Then add 1 package dry onion soup mix, 2 tablespoons tomato paste, and 2 cups of beef broth or stock. Set your Instant Pot to high pressure (it defaults to high), for 60 minutes. After the pressure cooker has finished processing, perform a quick release. Add onions, potatoes, and carrots. Set your Instant Pot to high pressure for 4 minutes. After this cooking cycle you may perform a quick release. If desired you can add a package of dry onion soup mix to the roast for an extra layer of flavor. Consider using root vegetables like parsnips and rutabagas for variety. 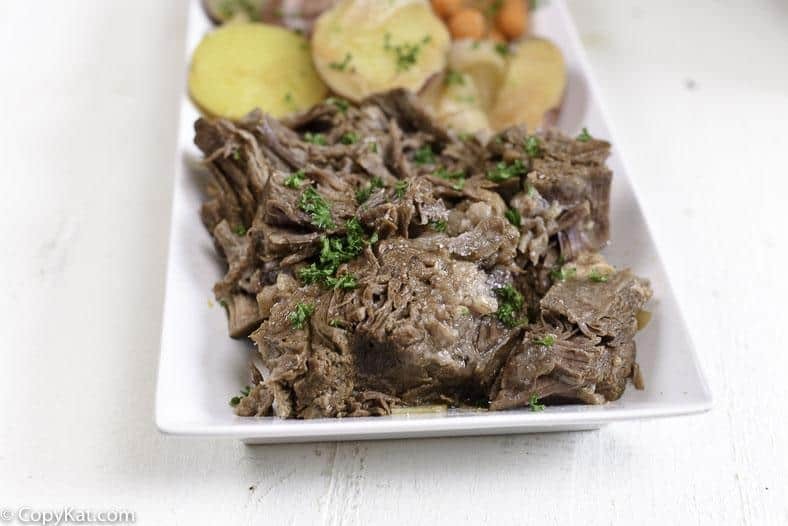 I just made this for our Sunday dinner and my husband says it’s the best pot roast I ever made and I’ve been making a pot roast in a slow cooker for years, but it’s never been this tender and flavorful! Thank you for this keeper of a recipe! So glad you and your family enjoyed this recipe! I told my family this recipe has handed down for millennia through my family. Obviously not true, but they loved it. This recipe was really good. I made it for a Sunday dinner. I have a 2 pound pot roast…..first time using my InstaPot….do I still cook it the same time? Yes, you still cook it for the same amount of time. We loved this roast, it is going into our regular rotation. This was the most tender of all roasts I have ever made. I request when you share a roast, you make it out of beef, ok.
Making a pot roast for your Instant Pot within reason easy to do to. Instead of braising it in the oven you may pressure cook dinner one in approximately half of the total time. I do some thing a touch exceptional than other recipes you can see on line. I want to cook my greens after the meat is cooked. I even have discovered that if I prepare dinner my veggies for the equal amount of the time I cook dinner the meat for the vegetables end up tender. I tried one of these this weekend. I really liked how easy it was to make, I also made the most tender pot roast ever. I put some parsnips into my vegetable mix. Your every page has some special post and i love to learn delicious dishes with your ideas and tips.Thank you admin. I used 2 lb bottom round roast frozen. I mostly defrosted the roast in the microwave. We will definitely make this again! I made this tonight. I didn’t have carrots but had enough extra red potatoes to make up for it. I added a good tablespoon or so of minced garlic from the jar as I’m a garlic fanatic. I browned all 4 sides..8 minutes per the first two (fat side down first) then 5 minutes on the last 2 sides. It turned out delicious! I can’t thank you enough as I’ll be packaging some of this into foodsaver bags to be heated up on other occasions. If I was doing low carb I can easily see substituting some cauliflower for the potatoes. I read somewhere though that beef broth/stock contains very little actual beef juices…it’s other things giving it the taste unless you are using a higher quality product like “Better than Boullion”. The article said the chicken versions on the other hand had significantly more and you could consider trying them in some recipes. So I don’t know if you are wanting alternatives to beef stock, or if you letting me know I should use Better than Boullion. I love the Better than Boullion products, I have been using them for some time. When I can I like to make my own homemade stock. I always keep a couple of boxes on hand for when I want to make a quick recipe, or if I am writing to write a recipe for the website. What is a Instant Pot ? Another name for a Power Pressure Cooker. Well worth the money. Could I use a marinara sauce instead? Thanking you in advance for your reply. Also, thanks for taking your time posting all the Delicious recipes. I’m very grateful for them. It does change the flavor, does it change the flavor dramatically, I don’t think so. It adds a nice nuance. Marinara has a lot of other flavors in it, onion, garlic, and more.